The air is cooler and usually much dryer, so your run will involve less discomforts like sweating and rapid dehydration. Dress lightly enough so that you're a little chilly at the beginning of your run, and then feel great at the end. You can also reap the bene?ts of layering by starting with a long-sleeved shirt and shedding it when you feel too warm. There is nothing prettier than the way the orange, red and yellow trees light up your surroundings before the leaves drop. The breathtaking views can really make a dull route feel fresh. It's fun to get out there and see which trees have turned, feel the crunch of leaves underfoot, and take in that unmistakable scent of fall in the air. Spring and summer races are full of squeaky new shoes, sunglasses and runners excited about the long-awaited end of winter. But fall races are sprinkled with capes, devil horns and wacky Halloween costumes. You'll find brisk Turkey Trots and Christmas-themed fun runs. Many races held in the fall are a far cry from the serious spring marathons. These races combine fun with hard work and let you loosen up. Fall is a time for comfort food. Thanksgiving dinner, pies, grandma's cookies, and family gatherings all lead to some serious calorie intake. The average American gains one to five pounds during the holiday season, and most of that weight is never lost again. Does that mean you have to sacrifice mashed potatoes and apple pie? Not necessarily. If you remain committed to your run schedule during these months you can stay ahead of those extra pounds. 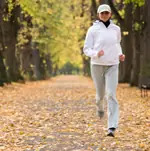 Run this fall to build your fitness and enjoy your surroundings. Trisha Reeves is an ultra-marathoner with more than 10 years of running experience.